In 1938, Frederic Dannay and Manfred Lee began writing scripts for radio shows. They broke their teeth writing for Alias Jimmy Valentine and The Shadow. On April 7, 1939, they premiered their own game s how, Author! Author!, which had celebrities finish an unusual story beginning, and then debate the other celebrity contestant’s stories. 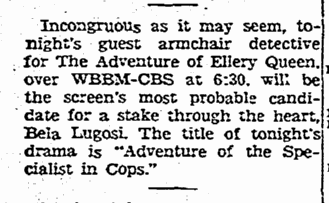 Finally, on June 18, The Adventures of Ellery Queen premiered. The weekly CBS show would remain on the air until September 22, 1940. The final character, Ellery’s secretary, was new to the radio show. The “Challenge to the Reader” of the earlier Queen novels remained, only with a twist. At first, a celebrity panel would argue who they thought the culprit was. This did not work out so well, so they introduced a panel of non-celebrities, which seemed to work better. 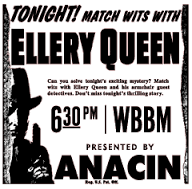 The Adventures of Ellery Queen returned as a NBC 30-minute show on January 8, 1942, and stayed on the air, with many cast changes, until May 27, 1948. Initially, the only new cast member was Carleton Young, who played Ellery Queen. Most of the scripts by Lee and Dannay have been lost, and audio archives are rare, but some do exist. In 2005, a compilation of 14 of the 60-minute radio scripts was published as The Adventure of the Murdered Moths (Crippen and Landau). 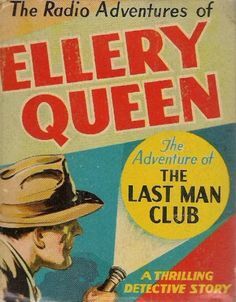 Others appeared in issues of Ellery Queens Mystery Magazine over the years, and three appeared in The Case Book of Ellery Queen (1945).